I have been selected as one of the finalists to create art for the United Terminal C and Houston Intercontinental Airport. By way of celebration, I will share something new. Click on the image for details. I’ll be back soon with more news and views. I had a little over a week off of work. I left my home in Ogden, Utah for an extended exploration of the landscape around Moab. Just before I arrived, a blizzard had blown through the area and all was blanketed in drifting, powdery snow (up to 3’ or 4’ in places). There was about 6” of snow on vertical cliff faces (it really blew through). These detail views from a recent work in progress bring that holiday back to me. I was the only one in a very snowy Arches National Park - hiking waist-deep in powder through Fin Canyon. I might as well confess, I also spend a lot of time looking at maps. I’ve been thinking about what goes on with me when I make art that may not be apparent to those who view a finished piece. The computer is one of my primary tools, and when working in some software, I am constantly zooming in to view the details of an image. Like a microscope, I can explore the structure and beauty of the minute details. 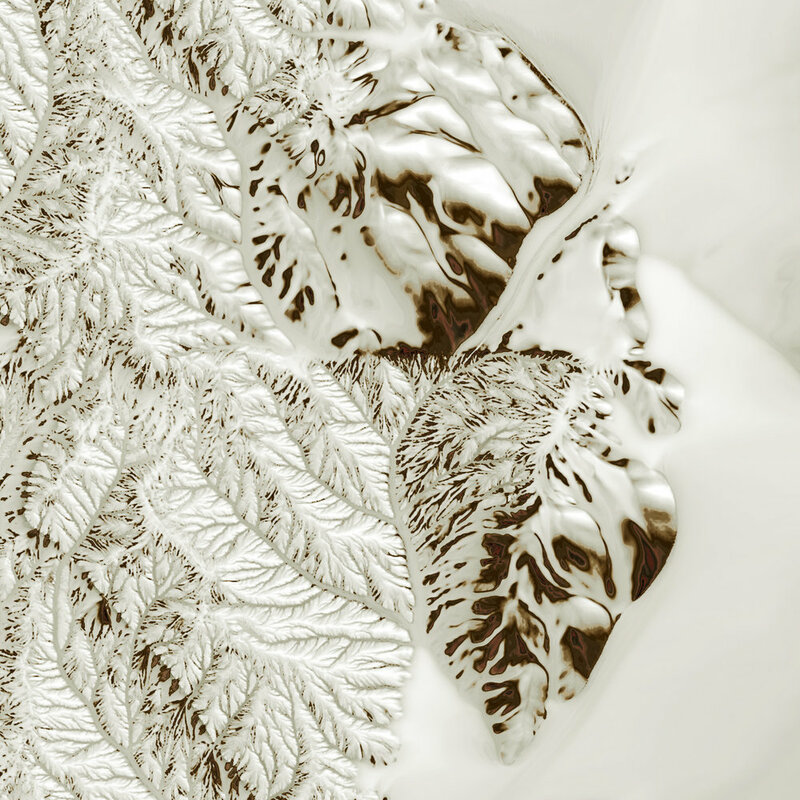 Here are closeup views from two different images I’ve been working on… they are part of a series exploring a landscape that I build and erode, extracting various types of data from the 3D landforms to make my 2D imagery. I have spent many years exploring the flowscapes of the Colorado Plateau and fell in love with both the large scale structures as well as the small details erosive processes carve into the land. 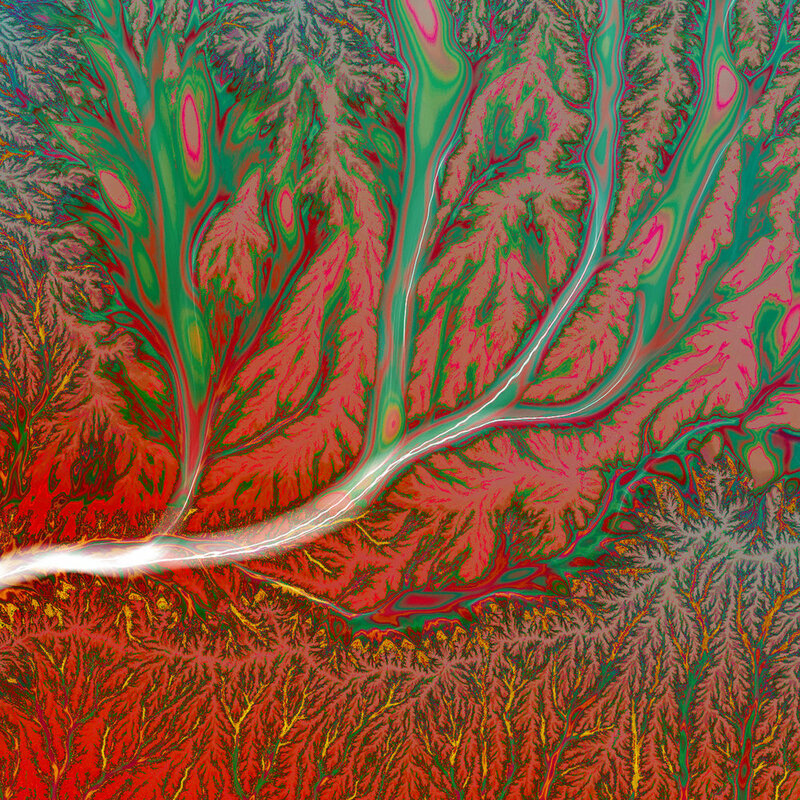 Further, the dendritic structures look like so many trees pressed into the land. After I posted the above, I realized that some photographs of erosion might be worth including. Here are a few examples (for illustrative purposes only)… imagine looking down on these landscapes. I’ll come across some more examples. For now, these grabs from a trip to Death Valley serve the purpose. I am intrigued by the repeated erosion forms - they repeat themselves at different scales (sizes). It is an example of natural processes generating fractal patterns. I like this. While collecting materials for a grant proposal, I revisited a lot of old artwork and spent a lot of time looking back on the old interests and working to tie it all together with current work. Funny, the trajectories taken by an interest of mine in fluid dynamics. In my teen years, I spent many hours focused on the aerodynamics of model airplanes and a general appreciation of the aerodynamic form. This led to a degree in aerospace and a career in the industry. This is when I came to an early understanding of the challenges of fluids. The equations remain one of the great unsolved mathematical challenges. One of the principle reasons for this is turbulence - chaotic fluid flows. 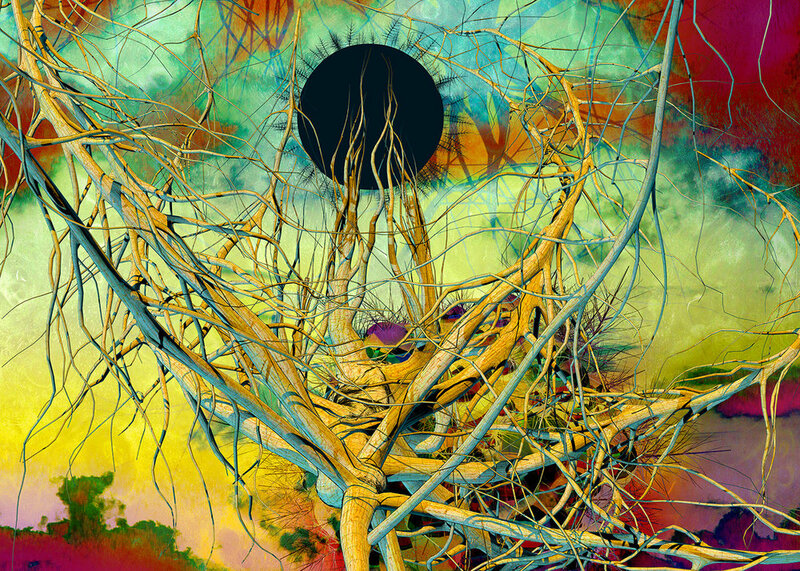 Jumping forward to the past 10 years or so and an extended exploration of chaos, iterated function systems, and ambiguous coding has provided a rich visual field to explore. These topics in math-made-visual bear relation to the chaos first encountered, but not fully appreciated in my work as an aerodynamicist. I am fascinated by the ordered randomness of chaotic processes. As mentioned in previous posts, I have recently returned to another interest, the eroded landscape. 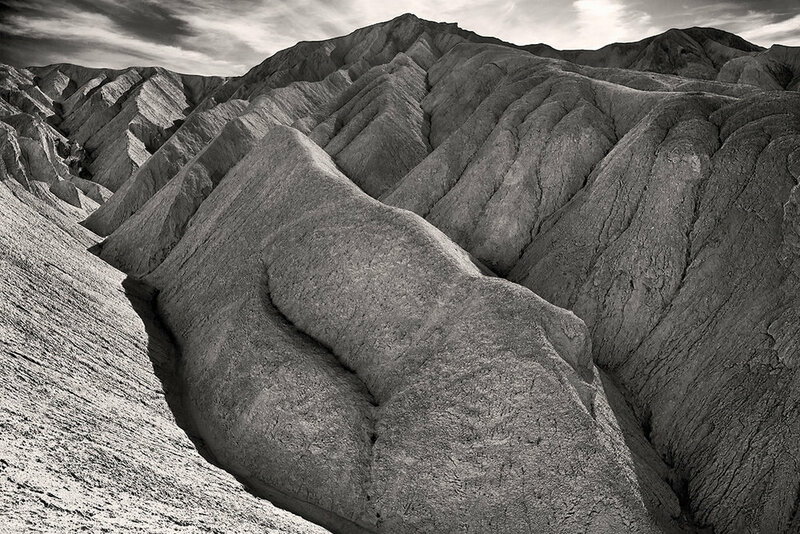 I have a love of the eroded landscapes found in southern Utah (and elsewhere). There are a number of processes involved in creating the many eroded forms found there. 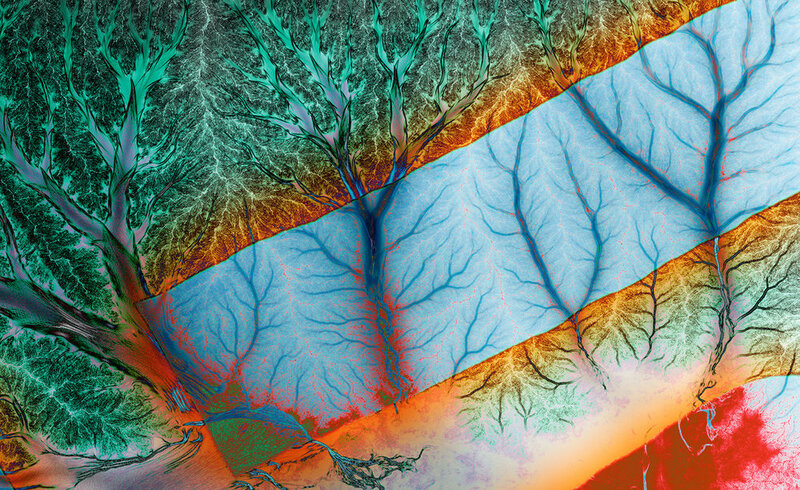 Fluid flows make such interesting marks on the land - complex branching systems that bear visual similarity to tree forms, circulatory systems, and more. 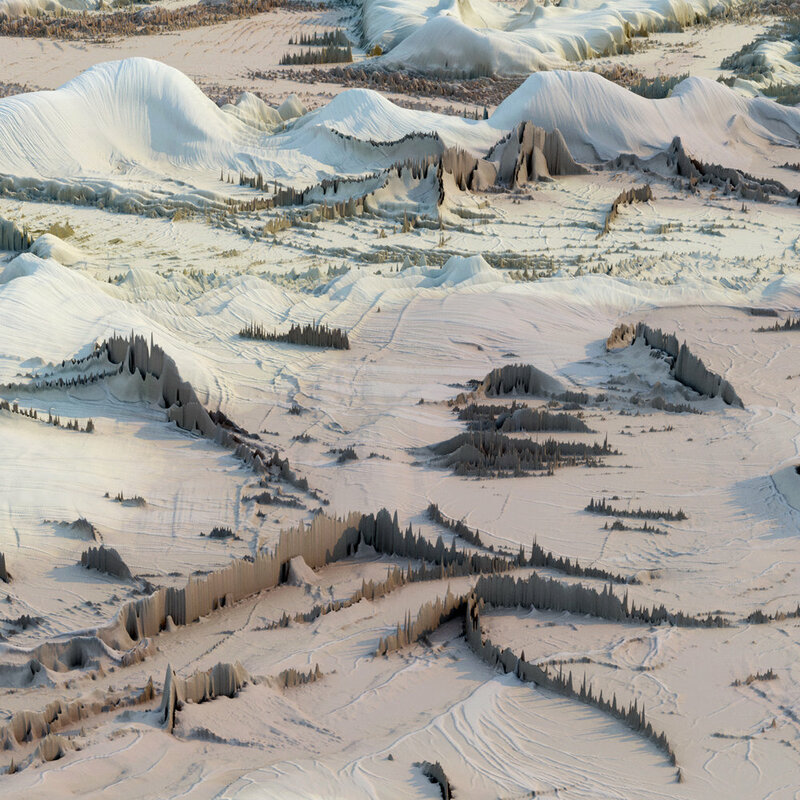 So here are a couple of examples of modeled eroded landscape. First, a detail of dendritic erosion forms. Here is an image I made a while ago. Kindred forms. I inserted a new gallery - two Views. Click on the image below and have a look! I plan to add (and subtract) to the collection as time goes by, but this is a good starting point. Simple pairings of photographs, no more. Remember, if you are on a pc, there is a small “+” in the upper right of each of the images in the strip preview. Click on it and get an enlarged view of the image. I was on the road this past summer and this photograph of Huerfano Butte was made. A pullout next the expressway (while traveling I-25 through Colorado) provided access. Apparently it was a historic way-point for those on the old trails. I can’t say I really understand why, given it is a short distance from very large and distinctive mountains. The butte is really quite small. Rendered here with a few embellishments. I have a few more things I’m adding to the toolkit as seen here. Much more goes on behind the scenes that I have yet to share. I will make amends, but for now the demands of the house restoration have me distracted. Home renovations have consumed much of our time. And I have neglected the blog. Well, to make amends, I offer this dyptych. Although I haven’t been posting to the website, I have been busy. This series is part of a update to the photography galleries on the website.